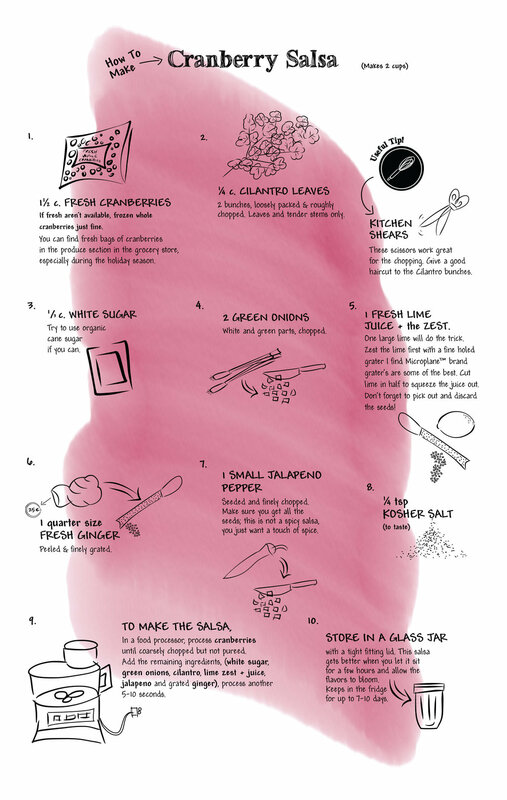 We're all getting ready for the Thanksgiving festivities, and I've gotten a lot of calls to repost my Cranberry Salsa recipe. I'm getting lots of requests for the salsa recipe because my site doesn't have a recipe search section. I know, I know, it wasn't the best idea to go with this simple of a template, but I honestly didn't think my blog would be as popular as it is or last this long, thank you all for that happy predicament! I'm pleased to announce that I'm in the midst of a full blog redesign for 2018 with recipe and category search capabilities, so it will be easy to find your favorite ones. This favorite recipe comes from Whitewater Cooks and Shelly Adams. It’s a raw salsa, so no cooking involved, just throw the cranberries in the food processor until coarsely chopped, throw in the rest of the ingredients, and whirl to zesty perfection. The salsa keeps in the fridge for days, but as mentioned last time, it won’t last that long! This salsa goes great on the turkey sandwiches the next day and is beautiful on top of a wheel of baked Brie.